The Lading Terus is a short stabbing spear used with an underhand thrust. It is made of a spear blade fitted into a dagger hilt. 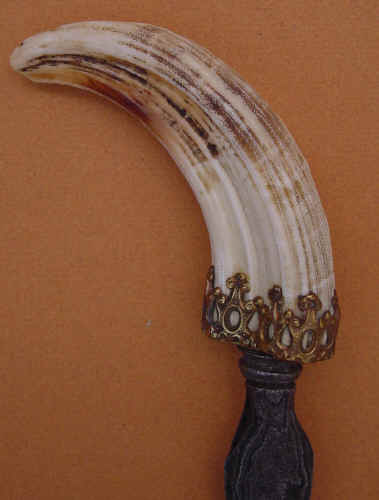 This unique Lading Terus has an ivory warthog tusk hilt with a gold mendak, a pamor blade with ada-ada, dapur Baru Cekel and a wooden sheath. Copyright © 2001 Dominique, Malay World Edged Weapons. All rights reserved.